Lamborghini says its Aventador supercar will have the world’s fastest-shifting series-production seven-speed automated manual transmission. The unit shifts in 50 milliseconds. In addition, it weighs 79kg and maximizes cabin space by packaging into an exceptionally narrow transmission tunnel. The transmission is produced by Oerlikon Graziano S.p.A. and its UK partner Vocis Driveline Controls Ltd. BorgWarner Inc. supplies the Aventador’s all-wheel-drive system. In the driveline, an electronically controlled coupling from Haldex AB distributes the forces between front and rear. The coupling adapts the force distribution to match the dynamic situation. A self-blocking rear differential together with a front differential electronically controlled by electronic stability control (ESC) make for even more dynamic handling. The Drive Select Mode System enables the driver to choose vehicle characteristics from three settings – Strada (road), Sport (sporty) and Corsa (track) – to suit their individual preferences. Robert Bosch GmbH supplies the Aventador with the ESC, as well as its windshield wiper drive. 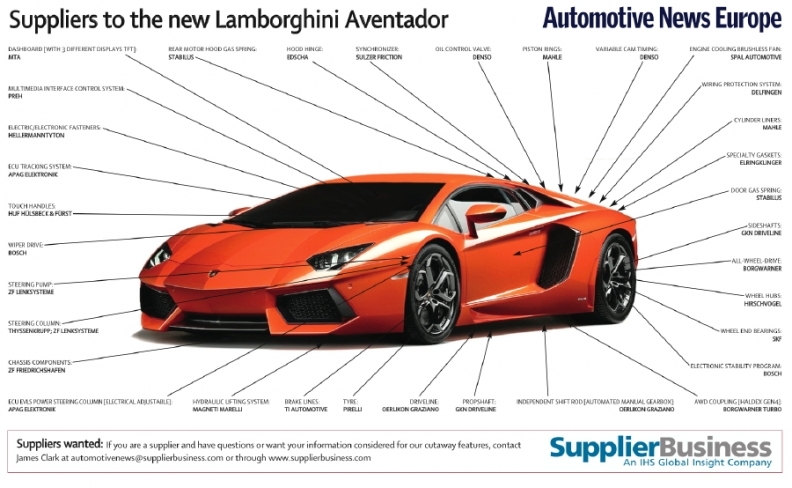 The lifetime production of Lamborghini's new Aventador is likely to be about 4,000 units , putting the model on a par with the Murcielago it replaces, which ran to 4,099 units, according to company data. IHS Automotive forecasts that Lamborghini will maintain production levels of between 600 and 700 models each year starting in 2011.